Some clouds. A stray shower or thunderstorm is possible. Low 56F. Winds SSE at 10 to 20 mph.. Some clouds. A stray shower or thunderstorm is possible. Low 56F. Winds SSE at 10 to 20 mph. UPDATE: Wisconsin-based Shopko has now announced that the Oelwein store will close. News of more Shopko stores facing closure became public late Wednesday. The Shopko Hometown in Oelwein is now on the most recent list of store closings. According to the Shopko website, the closing date for the Oelwein Shopko will be May 12. The retailer based in Green Bay, Wisconsin, filed for Chapter 11 bankruptcy protection in January and has announced it will close 70 percent of its stores. Iowa has 36 Shopko locations, mostly in smaller towns, like Oelwein. Twenty of the Iowa locations are set to close by the end of May. Those locations include Audubon, Bloomfield, Burlington, Chariton, Cherokee, Clarinda, Eldora, Emmetsburg, Estherville, Forest City, fort Madison, Glenwood, Greenfield, Ida Grove, Missouri Valley, Oelwein, Onawa, Toledo, Vinton and Webster City. In two previous stories on Shopko’s financial troubles, both the corporate headquarters and local Shopko manager Nathan Munley strongly stated that Oelwein was not on the list of store closures. Unfortunately, the effects from the Chapter 11 bankruptcy filing have now reverberated to the local mainstay for home furnishings, products, clothing and more. “We found out late Wednesday morning, a couple hours ahead of the public announcement,” said Munley, who plans to continue with the store through its liquidation. Munley said liquidation of the store’s products is expected to begin by the end of next week. He said customers will see a similar ongoing sale like Kmart had when it closed last fall. Discounts will start out at 20-30 percent and become greater as it gets closer to the tentative closing date of May 12. As for relocating, Munley said Shopko has no plans to relocate any staff to another store. He explained the company is closing 139 stores, which leaves only 125 remaining in business. It would not be feasible to try to move staff into fewer locations. He said the Oelwein Shopko employs about 20 persons in full- and part-time positions. Oelwein Chamber and Economic Development Director Deb Howard said she started working on possible business leads yesterday right after the Shopko closing was made public. 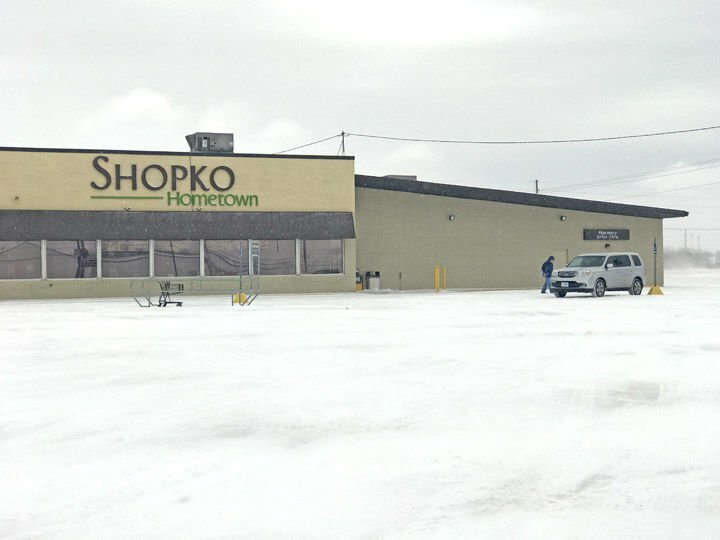 “I think it is important for people to know we are actively working to find a business to fill the void that Shopko will leave in our community,” Howard said. PREVIOUS REPORT ON JAN. 30: Is the Oelwein Shopko Hometown closing? Local manager Nathan Munley reassures area shoppers that the Oelwein Shopko is not on the list of stores closing in Iowa. Even in the face of more closings announced in Iowa, the list grew from three to now 11 stores, Munley says it is business as usual. Shoppers have noted that there are fewer products on shelves, and many items on clearance, leading them to believe otherwise. A media spokesperson for Shopko at the corporate headquarters in Green Bay, Wisconsin, also said the Oelwein store was not on the list. The woman confirmed that Shopko is leaving the pharmacy business and all of its pharmacies are closing. She said they are soliciting buyers for the prescription files at all of their pharmacies and noted at this time, they do not have a buyer for the prescription files in Oelwein. Shopko filed for a court-supervised financial restructuring under Chapter 11 on Jan. 16, in the U.S. Bankruptcy Court for the District of Nebraska. The company has assured its vendors that they will be paid for all goods and services going forward from Jan. 16. According to the company website, Shopko obtained up to $480M debtor-in-possession (DIP) financing to help fund and protect its operations during the Chapter 11 process. Although the spokesperson did not have a timeline for completion of the Chapter 11 process, she said the company wants to move through this as quickly as possible. She said updates will be provided as they become available on the website: shopko.com. The store locations closing in Iowa include, Cherokee, Eldora and Webster City on March 3; Estherville and Vinton on April 8; Bloomfield, Burlington, Clarinda, Fort Madison, Hampton and Onawa on April 15. Scattered thunderstorms in the morning, then mainly cloudy during the afternoon with thunderstorms likely. High 68F. Winds SSW at 10 to 20 mph. Chance of rain 100%.